In late 2014, I published a series of blog posts featuring youth in agriculture in Ghana for YPARD, an international movement of young professionals in agriculture. The series was significant for me in that it showcased the potential and the future of agriculture in Ghana. It also highlighted a few of the youth that inspired me in my work in Ghana, telling their stories as shared with me. I’d like to re-post that series here (with awesome credit to YPARD for their support in sharing these stories globally), in order to bring more light to these amazing individuals who are shaping agriculture in Ghana! This is the last post in the four part series. And this one is a bit different, because it doesn’t feature a Ghanaian youth, but rather a Canadian youth who was working in Ghana to support experiential learning of Ghanaian youth in agriculture. 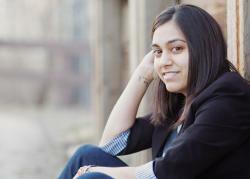 Aliya Lakhani parallels her own growth with that of the students. This post was originally published by YPARD in November, 2014. “Story captured by Miriam Hird-Younger, as part of the series “Investing in Youth in Agriculture – Engineers Without Borders Canada (EWB) in Ghana.” This Wednesday, this AgEx Venture Leader brings to us the success story of Aliya Lakhani, a Canadian youth champion who participated in the EWB Junior Fellowship program. After working with youth in agricultural training institutions in Ghana, Aliya, a young Canadian, has come to appreciate the importance of experiential training for youth as a cornerstone of agricultural development. EWB not only works with Ghanaian youth through programs like the one at Ghana’s Agricultural Colleges, but also deals with Canadian youth to build their understanding of issues of poverty, inequality and social justice. EWB believes that Canadian youth need to be global citizens, with the knowledge and attitudes to support development and be socially responsible in their actions. The Junior Fellowship program engages a few dozen youth each year to work with EWB programs and ventures in Africa from May-August. In 2014, Aliya Lakhani, from the University of Alberta, joined EWB’s partnership with Ghana’s agricultural colleges as a Junior Fellow. Through her work, she learned the significance of experiential and practical learning, especially in the field of agriculture. Aliya parallels what she learned in her own placement as a Junior Fellow, with the practical learning of agricultural students participating in community placements in Ghana – learning by getting outside of your comfort zone and into the field! “As a 5th year engineering student, I was given the opportunity to work in Ghana for 3.5 months with EWB’s Junior Fellowship program. I was tasked with facilitating the restructuring of the Internal Attachment Program (IAP) at Ohawu Agricultural College (OAC), one of the 5 public agricultural colleges in Ghana. The colleges expressed an interest in modifying the existing Internal Attachment Program, adopting a structure resembling my co-op engineering program whereby students were placed in farming communities surrounding the college and get to experience the lifestyle of a Ghanaian farmer. At OAC, the students were placed with both medium size and large scale commercial farmers in rural Ghana for 16 days. Over half of the Ohawu students were raised in urban areas and for most this was their first exposure to rural farming. They were faced with many of the same challenges that I faced as a Canadian working in Ghana: the language barrier, the need to quickly adapt to and navigate a new set of cultural norms, and being away from many amenities that had previously been taken for granted. From my conversations with farmers, students, and lecturers I was convinced that the students gained much from the community stay portion of the Internal Attachment Program (IAP). Before the IAP many of the students perceived rural farmers to be uneducated, unintelligent, and lazy. Even after a few days in the communities, it was evident that students were challenging their assumptions about rural farming livelihoods. And after working alongside a farmer for 16 days, not a single student still thought that farmers didn’t work hard. It took until my return home for me to realize that I have taken away from my placement many of the same things that the IAP taught the students. Supervising the students during their community stay and talking to the host farmers I was directly exposed to the ramifications of some of the inherent flaws in global food systems, chiefly the distribution of profit in the value chain. This post was originally published by YPARD in Dec 2014. There will be four stories in total, and this is the third, the story of Nicholas Onwona, which was originally published by YPARD in November, 2014. “Story captured by Miriam Hird-Younger, as part of the series “Investing in Youth in Agriculture – Engineers Without Borders Canada (EWB) in Ghana.” This Wednesday, this AgEx Venture Leader brings to us the success story of Nicholas Onwona, a Ghanaian youth champion who has benefitted from the Internal Attachment Program (IAP) and the Agribusiness and Entrepreneurship Project (A&E Project) of EWB. Nicholas comes from the Eastern Region of Ghana. 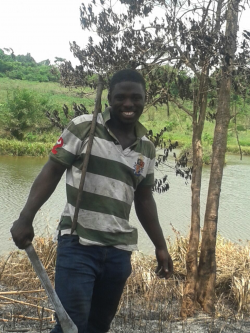 He is building his skills as a young agriculturalist through his studies at Kwadaso Agricultural College. 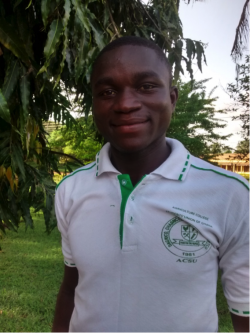 As this young Ghanaian gets closer to the end of his education, he is aware that building his own skills is not enough, he also wants to inspire his fellow youth to understand the opportunities available in the agricultural sector. Nicholas was born in rural Ghana, not too far from the capital city of Accra. He grew up working on his family’s cocoa farm and decided to continue his training in agriculture. At college, Nicholas participated in the Internal Attachment Program (IAP) and Agribusiness and Entrepreneurship Project (A&E Project), both co-developed by the Kwadaso Agricultural College and Engineers Without Borders Canada (EWB). In the A&E Project, his group developed a business model for a product they term ‘cocopeat’, an organic product to use in growing mushrooms. The product is derived from coconut husk, with added moringa. His final research project is exploring the use of basil to control termite infestations in cocoa production. Nicholas believes strongly in the need to increase use of organic inputs in agriculture in Ghana. He worries about the high rate of inorganic pesticides, herbicides and fertilizers, citing an instance where Ghanaian cocoa was rejected for export due to the high rate of pesticide residue. Upon graduation, he wants to go back into cocoa production, managing his own organic cocoa farm. “Most of my colleagues are frustrated.” He is concerned that youth find it is hard to get work. However, Nicholas doesn’t believe youth need to wait for a job. Instead, he wants to be self-employed and inspire the youth so that they too will think outside the box. “Stop depending on others and think outside the constraints of the system”. He recently held a series of talks for his fellow students on ‘Overcoming life challenges for success in agriculture,’ where he pushed his colleagues to think of business opportunities in agriculture and not get discouraged by the job market. Nicholas’ message to other youth in Ghana is clear: “There is a need to go back to our mother agriculture. We too can do something”. This post was originally published by YPARD in December, 2014 and can be viewed here. There will be four stories in total, and this is the second, the story of Emmanuel Akotia, which was originally published by YPARD in December, 2014. “Story captured by Miriam Hird-Younger, as part of the series “Investing in Youth in Agriculture – Engineers Without Borders Canada (EWB) in Ghana.” This Wednesday, this AgEx Venture Leader brings to us the success story of Emmanuel Akotia, a Ghanaian youth champion who led his fellow students through the pilot of the revamped Internal Attachment Program developed by EWB and Kwadaso Agricultural College. The minute you meet Emmanuel Akotia, who usually goes by ‘Emma’, you’re struck by his confidence and friendly manner. He’s open and easy going. And if you’re talking about agriculture, Emma has a lot to share. His social media profile picture features him in boots, holding a cutlass, with the quote “I am proud to be a farmer”. In Ghana, not all the youth would proudly state their love for agriculture. Most youth want cushy jobs in an office with a suit and tie and air conditioning! Agriculture is perceived as ‘poor man’s work’, full of drudgery and difficulty, with few opportunities for self-advancement. Emma doesn’t see it that way. He sees the potential, the opportunities and the financial benefits of investing in agriculture. In 2013, as the head first year student (at the time), Emma led his fellow students through the pilot of the revamped Internal Attachment Program developed by Engineers Without Borders Canada (EWB) and Kwadaso Agricultural College. The program includes a one week rural placement where students live and work alongside rural farmers. For some, it was their first foray to a rural farm! Many students were hesitant saying “we can’t go to the village.” However, Emma supported the college in organizing the students for the program, and he himself also participated in this pilot. He explains the program as “we went to learn about the problems on the farm and give a helping hand in one way or another”. When he came back, Emma was full of new insights and surprises of rural and farmer livelihoods in Ghana. He better understood the culture of farmers in the community and the challenges of technology adoption. He built skills in community entry and problem solving. In the end, Emma was surprised by the gender challenges that he saw in the field as well as by the sheer number of female farmers. Learning something on paper in a classroom is definitely different than seeing and experiencing it yourself. A year later, Emma still keeps in close contact with the family he stayed with. The family even gave him his own plot of land in the area so that he could start his own farm with some of his fellow students. Now, while still in college, he’s able to gain a lot of practical experience. He, along with three other student colleagues, used this plot to produce maize the year following their placement. This experience will be very useful when he starts his own career – as an agricultural entrepreneur with cash crops and a poultry farmer. At Kwadaso Agricultural College Emma is the head of the Student Representative Council. He is a born and bred leader. As he prepares to graduate in early 2015, he is set to continue that leadership, showing Ghanaian youth that you can become a successful business person in agriculture. Emma has a vision of a growing and profitable agricultural sector in Ghana, and we expect that his story and vision will inspire youth not only across the country but also across the globe! Click here to watch Emmanuel Akotia‘s feedback on his forey to a rural farm with EWB and Kwadaso Agricultural College. **This blog post was originally published by YPARD in December, 2014.